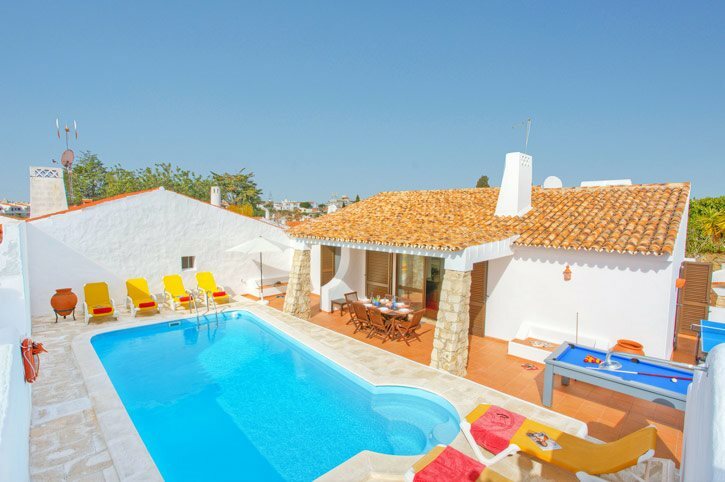 If you want a centrally located property, Villa Aveiros is the perfect choice! The facilities along the mile-long Praia D'Oura Strip are only are only a few minutes' walk away. The Strip is lined with a never-ending choice of lively bars, cafes, shops and restaurants leading down to the beautiful sandy beach after which the resort was named. This 3 bedroom villa has a bright and airy interior and a private pool. Air conditioning/heating in the bedrooms and WiFi are included. The fantastic central location makes this the perfect choice for a lively holiday with bars, clubs, shops and restaurants on your doorstep. Outside, the private swimming pool is surrounded by terracing with plenty of space to sunbathe. The covered terrace outside the lounge provides some much welcome respite from the sun for alfresco dining and is complemented by the brick BBQ on the other side of the villa. Although a car is not necessary, there is plenty of street parking outside the villa. A pedestrian gate opens onto the villa grounds, with a path and steps down to the villa entrance which opens into the living area. The open plan living area has comfortable seating around the feature fireplace and a dining table and chairs for entertaining your party. The room curves around to the right where there is a fully equipped kitchen. Patio doors by the lounge open onto the exterior dining terrace with steps up to the private swimming pool. There is a double bedroom with patio doors opening onto the terrace at the side of the villa, plus a separate shower room adjacent. The 2 twin bedrooms share a second separate shower room, and one of them has patio doors onto the pool terrace. This villa has applied for a licence and the submission number is 450.10.33/2015/76. The licence number will follow. This villa has an enviable position on Portugal's South Coast in the lively resort of Praia D'Oura. The resorts' famous Strip is within a few minutes' walk - perfect for anyone wanting to have a choice of bars, shops and eateries on their doorstep! The old town of Albufeira has a more traditional feel and is only 5 minutes away by car, as well as a choice of other fantastic beaches, places to visit and activities. Villa Dela is along the same street. The nearest supermarket is less than 5 minutes' walk away, along with some smaller shops. Alternatively, head into Albufeira, where the older part is ideal to get a taste of the past with its narrow streets, handicraft shops and traditional Algarvean colours. There are wide shopping streets and a lively atmosphere, particularly in the large square with live music featuring at times. A short stroll from the villa, you'll find an abundance of restaurants and bars along Praia D'Oura's Strip. At night, the resort really comes to life, with many of the bars and clubs offering a great, lively atmosphere and opening until the early hours in high season. For something more traditional, the old town of Albufeira is 1¾ miles away with a good choice of bars and restaurants to suit all tastes. Praia D'Oura Beach is a beautiful expanse of golden sand, lined with a selection of beachside cafes where you can take a break from the sun and have a bite to eat - it's just 5 minutes' walk from Villa Aveiros. Nearby Albufeira also has a sandy beach lined with waterside cafes. A number of other excellent beaches can be found along this stretch of coastline such as the picturesque cove beaches at Coelho, Castelo and Gale. A little further afield, 20 minutes' drive on either side of Albufeira, are the sandy stretches of Praia Grande to the west and Falesia to the east. There is also a good choice of activities for a great family day out, including a couple of waterslide parks and the popular Zoomarine Oceanarium and dolphin show all within a 20 minute drive. The Algarve is very popular for golf, with a number of excellent courses in the area. The 9-hole Sheraton Pine Cliffs course is nearby at Olhos D' Agua, with 4 full golf courses within a 25 minute drive at stylish Vilamoura. Parque Aventura, situated in Santa Eulalia, Albufeira, comprises of a paintball centre and various adventure courses through the trees made up of zip wires, bridges and ropes. Villa Aveiros is not available to book for season as it is sold out. Take a look here at the Algarve villas that are currently on sale. Try windsurfing at Praia D’Oura or waterskiing at Falesia beach near Albufeira. During the summer months, the Acoteias complex near Falesia offers other watersports. Outstanding villa, exceeded expectations. A huge thank you for such an amazing experience! Great villa, very well equipped. Spotlessly clean with excellent facilities, location to resort was very good and a short walk to the beautiful beach. The villa is lovely and very convenient for The Strip. Spacious and clean villa, very well equipped and parking right outside. Lovely pool area. This was our first villa holiday and we found Villa Plus excellent. Villa was great in all ways, could not fault it at all.